Ballerina Rose: She will be the dancing queen with this gorgeous collection!! Featuring ballerina and swan motifs as well as beautiful platings and stone work this collection is sure to merit an encore! 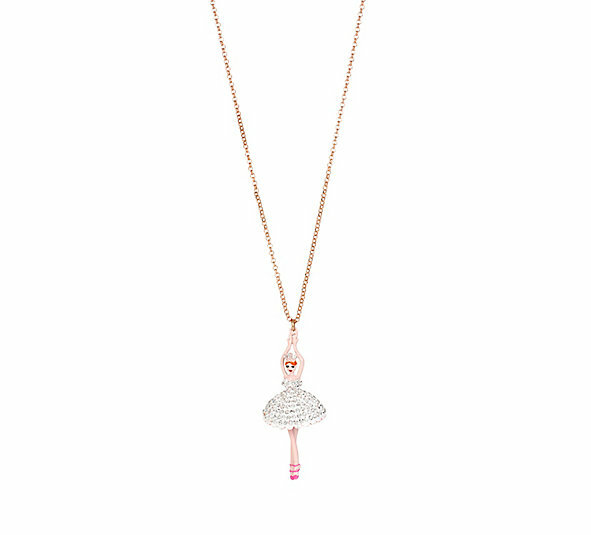 Pave ballerina Y-shaped necklace Rose Gold tone Mixed faceted beads, faux pearls, roses and round crystals Pink Ballerina with pave crystal accents Lobster claw closure Materials: metal/glass/plastic Length: 16" + 3"ext Frontal width: 1.5" Frontal drop: 4.25"